What could be a more comforting and healthy way to start a cold winter day than a nice, warm bowl of oatmeal? Luckily, you don’t have to dirty your kitchen or travel very far if you need a quick fix. With chain restaurants under increasing pressure to improve the nutritional quality of their meals, it makes sense that this old-fashioned food has found its way onto the glossy overhead menus behind the fast food counter, next to the coffee, bagel and breakfast sandwich offerings. But is fast food oatmeal any good? Or any good for you? One brisk morning, in need of fortification before facing a day of classes, two Friedman students went on an oatmeal expedition in Boston and offer this report. First stop, McDonalds on Kneeland Street (no, we were not going in there for a Big Mac at 10:30 in the morning – honest!) where a pleasant surprise awaited us. The oatmeal itself was light and creamy, and our simple cardboard bowl of oatiness was studded with small chunks of apple, two kinds of raisins and dried cranberries. The cost: a respectable $1.99. We skipped the optional brown sugar, hoping to start the morning on as healthy a note as possible. But not so fast. 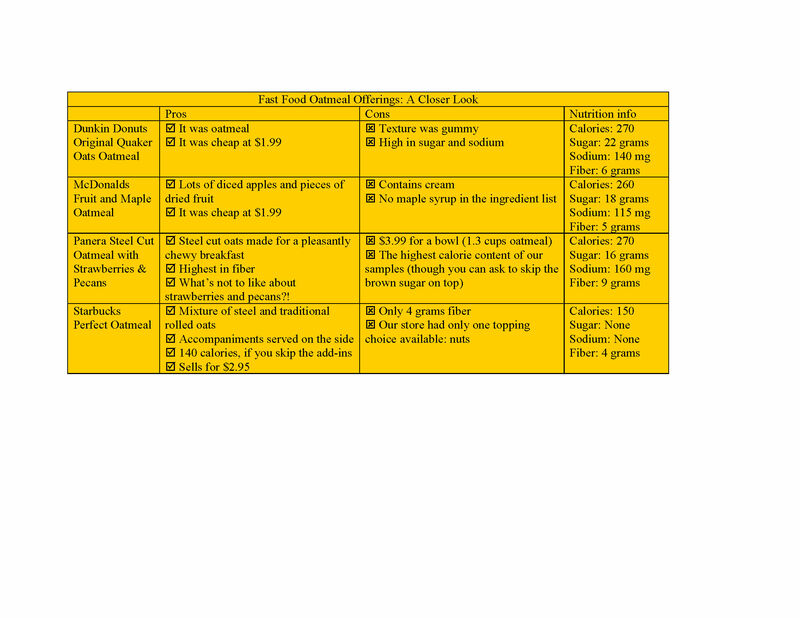 Later in the day, an online examination of the nutrition facts provided by McDonalds, told us that our single 9.2 ounce serving contained 260 calories, 115 milligrams of sodium, 5 grams of fiber, and 18 grams of sugar. As it turns out, the creaminess we liked was not from the texture of the cooked oatmeal, but from the addition of light cream. And, in an expose last year in the New York Times, Mark Bittman noted that the “cream” actually contains seven ingredients, only two of which are dairy products. And it’s a good thing we skipped the brown sugar version: it would have added 30 calories to our count, as well as 45 mg of sodium, and 14 grams of sugar. Next came Dunkin Donuts. There was no disguising the source of this oatmeal. The serving bowl had “Quaker Oats” written all over it, and its taste resembled that of packaged instant oatmeal. Our bowl of oats were a bit gummy, the flavor bland. Again, we opted for the simplest choice, a $1.99 container of oatmeal with the dried fruit topping. Dunkin Donuts doesn’t specify the container’s size, but it appeared comparable to the McDonalds serving. 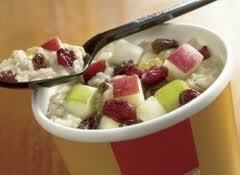 At Dunkin, the oatmeal came with 270 calories, 140 mg of sodium, 6 grams of fiber and 22 grams of sugar. If we’d opted for the brown sugar version, our calorie count would have gone up modestly, but the sodium would have soared to 470 mg.
We thought we’d take a step up in the fast food world and visit the Panera at the corner of Kneeland and Tremont Streets. Sure enough, the oats served here are organic, steel cut, and served with strawberries, pecans, and a crunchy cinnamon topping –a combination that would prove hard to beat. The chewier oats had plenty of flavor and even the out-of-season strawberries were respectable. Of course, we paid a good bit more for this lovely morning treat: $3.99 for a serving of about 11 ounces. Alas, the calorie count was the highest so far at 320 calories and, according to Panera’s website, that fancy bowl of oats contained 160 mg of sodium. Sugar checked in at 16 grams, and this offering was highest in fiber at 9 grams. With just enough time for one more stop before we were due in Jaharis, we entered the Starbucks on Washington Street, across from the entrance to Tufts Medical Center. Here, according to their website, the $2.99 bowl of oatmeal is a mixture of steel cut and traditional oats and is served au natural with optional toppings provided in separate packages to be added according to taste. At 150 calories with no sodium and no sugar, the base oatmeal would seem the most nutritious of the four breakfast outlets. The fiber count was the lowest at four grams. Each of the toppings adds about 100 calories to the meal. We sampled the nut medley, at 100 calories and 1 gram of fiber and sugar. The dried fruit option also adds 100 calories, and 22 grams of sugar. The hearty blueberry topping, (not available on our sampling day but tested at a different location), was excellent for a mere 20 extra calories and three grams of sugar. How do these fast food versions compare to a bowl of oatmeal you can make at home using Quaker Oats brand cereal? A ½ cup of dried oatmeal, mixed with water, yields a 150-calorie serving, 1 gram of sugar and no sodium. However, grab one of those quick packs of instant oatmeal with flavoring such as brown sugar and maple, or apples and cinnamon, and the sodium and sugar counts rise dramatically. So, what’s the verdict? 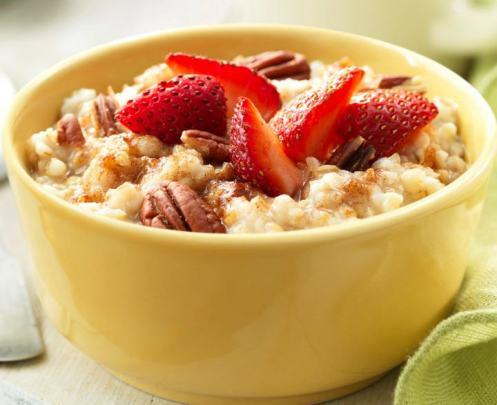 If you find yourself in a fast food spot and are hungry, a bowl of oatmeal will take the same bite out of your wallet as the other breakfast offerings, but you will save more than a few calories for your morning meal. At Dunkin Donuts, it’s definitely one of the healthiest items on the breakfast menu with bagels starting at 300 calories and breakfast sandwiches at 350. Some donuts mirror the oatmeal breakfast calorie count of 270, but assume you’ll double your sodium intake and possibly your sugar, too, all for something a lot less satisfying than oatmeal. At McDonalds, only the fruit and yogurt parfait has fewer calories – at a smaller serving size – than the oatmeal among breakfast entrees. For guilt-free oatmeal, we’d suggest you go with Starbucks. But if you like to your bowl of oats a little dressed up, our taste buds pronounced Panera’s a fine way to start the morning. McDonalds earned third place because of the nice mix of apples and dried fruit. 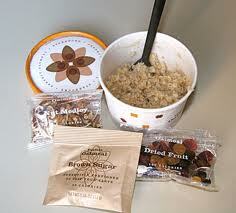 And, even though Dunkin Donuts oatmeal was not a stand out, it would still warm the belly on a frigid winter morning. M.E. Malone is a first-year MS/MPH student who, in her childhood, was charged with cooking oatmeal for breakfast twice a week before school for the entire family — of nine!